Capt. Bubba Ray admires a large speck that was enticed to strike by a corky fat boy. Earlier articles have addressed how October is the transition month from summer to fall fishing; however, there also exists another transition and this is in baits. During the summer months. when trout and other fish tend to be found in deeper, more oxygenated waters, live bait, particularly shrimp and croaker, are the choice of the majority of anglers. Most of the fishing is from anchored boats or limited to drifts over deep shell reefs and shell pads and live bait tends to work the best. Come October, a variety of baits come into the picture, especially soft plastics and top water lures. The shorter days and cooler waters of October move fish out of their summertime refuges and send a signal that winter is not far away. Nature tells fish to start adding layers of fat to get them through the sparse winter months and a feeding frenzy usually begins. When this occurs, trout, reds and other fish are not as selective on their choice of food and almost any finfish or crustacean appeals to the appetite. Artificial lures then become one of the favorite baits of anglers. Fall fishing opens up wade fishing areas that were not productive during the summer and working seagulls attract lots of fishermen to schools of trout in the open bays. Both types of fishing are ideal for the anglers using soft plastics and hard plastic lures. Wade fishermen enjoy the thrill of top water action early in the day by tossing floating baits that, when worked slowly, resemble injured finfish, especially small mullet. Soft plastics are used at all times during the day and can be worked to resemble not only shrimp escaping from a feeding fish but an injured mullet as well. Live baits continue to be productive for anglers fishing from anchored boats and likely are the best choice for that type of fishing. Now, let’s take a look at what artificial baits work best and when. Wade fishermen find that using any type of artificial bait beats having to drag a live well behind them while at the same time offering a wider variety of choices for fish. Lures, both soft and hard plastic, are easier to throw and allow the wader to cover more water in a shorter time span. Drift fishing with soft plastics is the preference of most fishing guides. This applies to working flocks of birds pointing the way to schools of feeding trout and reds. Top water baits such as Top Dogs, Super Spooks and Bombers normally work best in the early part of the day when daylight is marginal to poor. Anglers locating pods of mullet close to the shoreline tend to capitalize on top waters, especially those that are mullet imitations. Soft plastics such as Bass Assassins, Texas Trout Killers and Gulps work well almost anytime. Before stepping out and using artificial baits, anglers need to have at least fairly good casting skills. If not, the odds are going to go against you and live bait would be the better choice. One mistake that inexperienced “pluggers” (a term applied to fishermen using artificial baits) make is in the retrieve. Most tend to reel in the baits too fast. 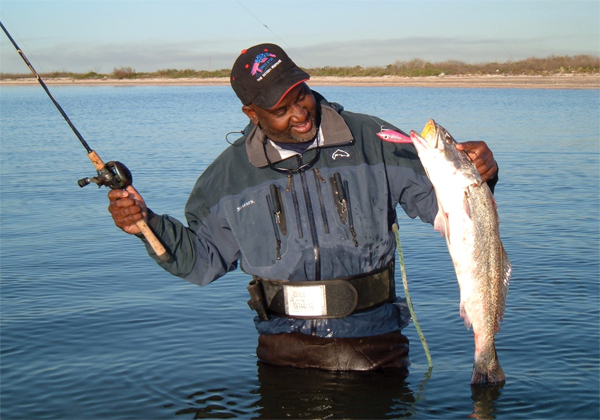 If you are new to this type of fishing, either go along with a seasoned plugger or hire a guide to show you the techniques. Most newcomers to this type of fishing are surprised at how slow the bait is often retrieved. Fall fishing is arriving and the better prepared you can be, the better. Once an angler gets accustomed to using artificial baits, it often is difficult for them to return to purchasing live bait during the fall. These are great tips Capt, Joe and I know Bubba Ray personally. The guy is one heck of a fisherman and full of knowledge. He’s actually fishing the HT Redfish series with his partner Leon. They did very well during the tournament and managed a ranking in the top 10 a few times to bring cash money home. Thanks for the tips on Fall fishing. It’s October again so were transitioning to some of the best phases of fishing along the coast.